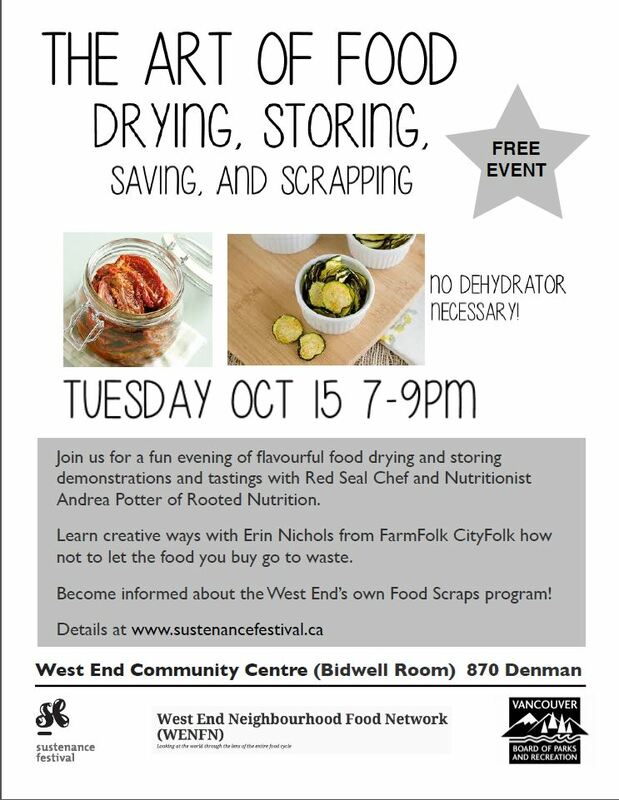 Register online HERE with Community Centre, or with https://wenfn-oct-15.eventbrite.com (or just show up). This event is part of the 2013 Sustenance Festival (October 8-22). See Vancouver Sun article by Randy Shore – Nourish your soul and lighten your footprint at Sustenance Fest. Reducing food waste has been identified as number two among the ‘Top 5’ biggest potential Ecological Footprint-reducing contributions being used by Vancouver’s Greenest City Lighter Footprint “Feet to the Fire” Committee as a baseline. We acknowledge the West End Community Centre for kindly providing space, and the Vancouver Park Board for support and cooperation. Hi, how do people register for this event?